Hello friends, Welcome to How To India! Today in this post i will share with to How To Make Free Blog Using Wix.com with pictures for free! If you want to create without any blogging or programming skill read this article it will helps you 100% to make free website or your personal blog. If you have any special technical or other knowledge and you want to share with with everyone, so you must need to create a blog and share anything you want & you can also make money through Google AdSense. About Wix: Wix.com is a site that lets you create your own Flash-enabled site for free. Although getting a custom domain and unlimited bandwidth (among other things) costs money, everything else is free. 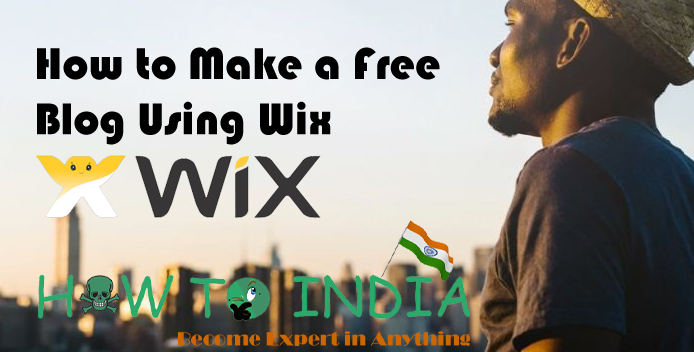 Follow these steps to create free personal blog with wix. 1. First of all Go To Wix.Com, then click on Start Now button. 2. Now Login or Signup on Wix or you can use Google or Facebook for quick login. Use google for login and allow wix permission. 3. After Signup, now select what kind of website you need? In this page select your website category like if you want to create Blog, so click on blog for next step. What Kind Of Website you want to create? 4. Choose the editor you need to use? For beginners i recommended ADI, Because you didn't need to any programming and it is easy to build a website. Choose the editor you need to use? 5. What kind of blog you need to create? Now choose what kind of blog you need to create like if you need to create personal blog click on personal blog for next step. what kind of blog you need to create? 6. Enter the name of your website or blog! Now enter the name of your website or blog you need to create. 7. Now enter the address if you want to add or skip! If you want to address of your business or where is located your blog? 8. Ready to use wix. Click on start and you will get manager of your blog or website editing posting or publishing. 9. Now select the theme! Now select theme and get final step, it will be changed anytime you want. That's it! When you are ready to publish your website, click publish in the corner. Enjoy your website. Remember to check out the Wix app market in the editor. They have lots of cool, free things you can add to your website to increase its functionality.